The UNESCO Waterberg Biosphere Reserve is home to predators, one of which is the rare and elsuive leopard. Although our particular area is mainly home to buffalo and plains game, the majestic leopard does roam the surrounding mountains and dwells deep within the vegetation. The Waterberg has a wide variety of flora and fauna. 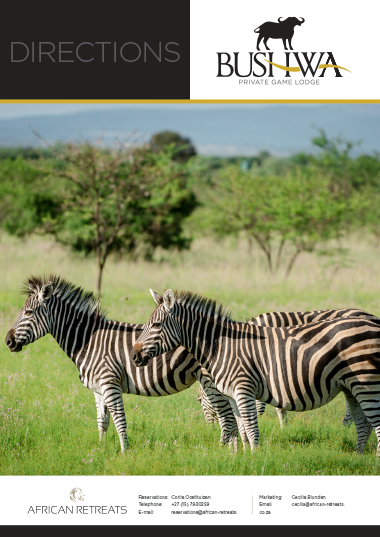 The diverse reserve sustains over 40 species of game including buffalo, sable, giraffe, nyala, gemsbok (oryx), kudu, eland, blue wildebeest (gnu), red hartebeest, zebra, impala, bushbuck, duiker, steenbuck, mountain reedbuck, waterbuck, warthog, blesbuck, baboons, bushpig, klipspringer, leopard, jackal, brown hyena, caracal, civet and genet to name but a few. 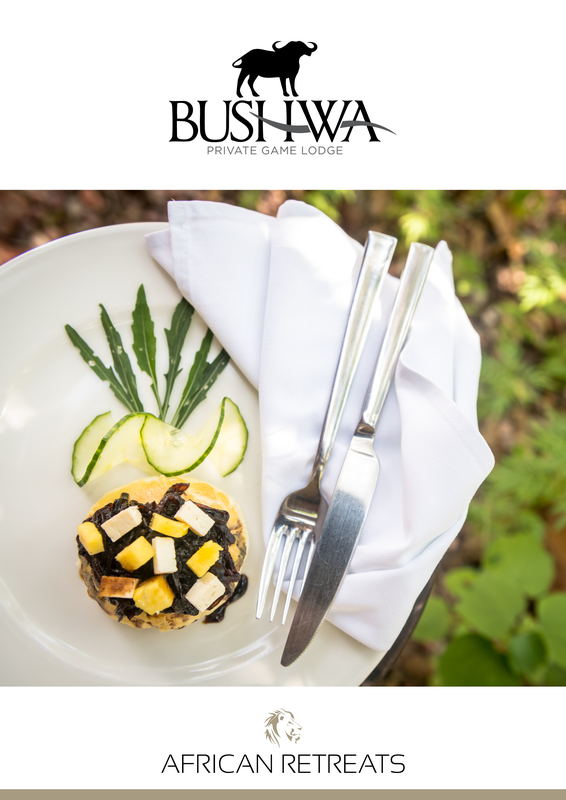 The Waterberg is home to plenty of birds, and there are over a 150 species of bird spotted here at Bushwa. The variety of savannah types, plains and diverse flora provides the perfect habitat for birds such as sugarbirds, Cape vulture, half-collared kingfishers, white-backed night herons, Verraux's eagle-owl, mountain wagtails and ant-eating chat. African Retreats conducts the marketing and reservations for a portfolio of safari lodges based in South Africa's esteemed Kruger Lowveld. 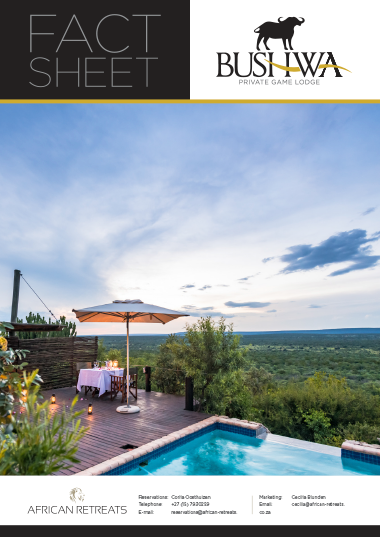 These carefully selected safari properties occupy enviable locations in the Greater Kruger Park area, some with astounding riverfront views and others nestled comfortably in game reserves surrounded by the tranquility of nature. African Retreats sews together itineraries incorporating South Africa's most sought after destinations including the Kruger National Park, Kruger and Canyon boat cruises, Panorama Route tours, hot-air ballooning and wildlife activities (game drives and bush walks) within private game reserves. 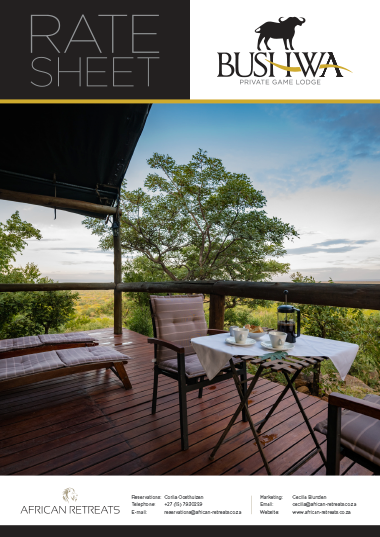 The focus here is on experiencing the Kruger region in its entirety while staying in accommodation surrounded by the bushveld.